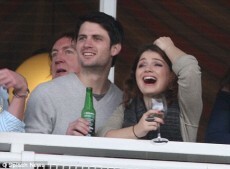 Bono’s eldest daughter, Eve Hewson (19), is dating the “One Tree Hill” star James Lafferty. The couple were spotted together enjoying the holiday season in Dublin. Over Christmas the two love birds frequented the Dalkey watering hole The Queens and also another bar, close to Eve’s Killiney home. "Things seem to have gotten very serious between them very quickly because James has been in Killiney and Dalkey loads recently," a source told the Herald newspaper in Dublin. "Any time I've seen them in The Queens pub together, they've been all over each other. They seem to be very in love and don't care who knows about it. "James is an attractive guy so he stood out a mile when he came in the first time -- in fact people recognized him a lot quicker than they recognized Eve because of his role in One Tree Hill. "She is a very lucky girl and things look like they are going great for them. James bought them a few drinks and seemed to be very attentive and affectionate. "He was showering her with kisses a few days ago in front of all the other punters. "Eve is not widely recognized in the area so nobody makes a big deal of her here so I think that is probably why she prefers going out here rather than into some of the more high-profile clubs in town. "James seems to be constantly flying over and back to see Eve so they are clearly very smitten." The new couple were also spotted walking around Stephen’s Green in recent days and they also did a spot of shopping on Grafton Street. 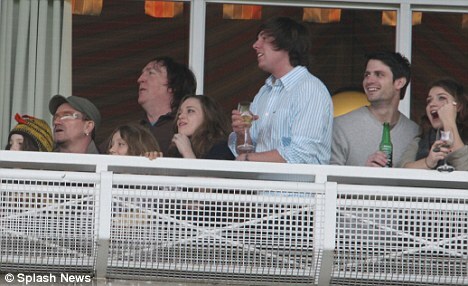 The pair made headlines for the first time over the Christmas period when James (25) joined the Hewson family, including rockstar Bono, for a day at the popular Leopardstown racing festival.